On a good day, a passerby probably wouldn't notice my dark circles. On a bad one… Let's just say that I've had multiple strangers approach me asking if I was okay because the purple puffiness under my eyes misleadingly indicated tears. Unsurprisingly, this has been my greatest skincare baggage (mind the pun)—especially because under-eye bags are rumored to be genetic, so I have no control over what they look like. That's why I decided it was time to ask a few specialists and get to the bottom of what causes dark circles, and if possible, how to get rid of them with a simple over-the-counter cream. If you've been on a similar hunt, you're in the right place. We reached out to five leading dermatologists to share their expertise with us, Cindy Yoo Soon Bae, MD; David Shafer, MD, FACS, of Shafer Plastic Surgery; Francesca Fusco, MD; Dendy Engelman, MD; and Melissa K. Levin, MD, who is also a clinical instructor at NYU Langone and Mount Sinai Hospital. Here, they explain the potential causes of dark circles, offer lifestyle shifts and healthy habits that can help reduce them, and tell us how to find the best eye creams for dark circles. Read through their comprehensive cheat sheet below, and then find the best eye creams to treat and reduce dark circles. "It's important to first understand the anatomy of the eye," Levin says. "Eyelid skin is one of the areas where the skin is the thinnest in the body. So essentially you have very thin delicate skin sitting over a hollow structure around the eyes where you have bone, blood vessels, fat pads, and muscles." Shafer agrees: "Dark under-eye circles are multifactorial." Think about it this way: "There can be dark blood vessels, which are visible through the skin. Then there's the skin itself, which can be thicker and opaque, or thinner and translucent. Then there's the surface of the skin, which can be dark with increased pigmentation. Many of these factors can be genetic, a result of your body's development, and environmental. However, in most cases, it's a combination of all the above." Each doctor agrees that there are usually several different underlying causes and variables at play. "Yes, there can be a genetic component, but also environmental and lifestyle causes," Bae tells us. Engelman agrees that it can be a combination of things. "[Some people] are born with under-eye circles, and that falls into the hereditary category," she says. "They're born with thinner, paler skin with more pigment under their eyes, and/or slower vascular movement. If you're blessed with any of the things I've mentioned above, also know that certain behaviors can worsen your dark circle problem." Dilated blood vessels leading to infraorbital edema ("swelling/puffiness") from inflammation. Before we get into some of the treatment options and at-home remedies, let's start by addressing some lifestyle changes. How to Address Sinus Congestion: Chronic sinus congestion can lead to enlargement of the under-eye veins, which are filled with dark colored blood. These veins can be visible through the skin or give a darkish hue around the eyes. Engelman suggests using "a daily sinus irrigation with a neti pot or similar product to clear the sinuses and improve the under eye appearance." If that sounds too labor-intensive, go the relaxing route with "lymphatic drainage massages that you can do yourself reduce the puffiness, or leveling your pillow so that water doesn't pool underneath your eyes," as Engelman also suggests. How to Address Allergy Issues: Shafer reminds us that "allergies and sinus congestion can perpetuate dark under-eye circles. Controlling your symptoms and irritants can help reduce the consequence of under-eye changes." Engelmen offers some simpler solutions, like "speaking to your physician about getting antihistamines (e.g., Zyrtec, Claritin)." Also, Fusco says it can be as simple avoiding rubbing at your eyes. "Individuals who have eczema or allergies tend to rub at their eyes a lot, and this can result in a form of dark skin called hyperpigmentation," she notes. Generally Healthier Habits: Bae says self-care is essential, so things like getting more sleep, being "gentle with your eyelid skin when washing your face or taking off makeup (don't rub), addressing any allergy issues, and using sunscreen daily" are all good (and easy) habits to pick up. Shafer echoes that "being overtired can definitely affect your under-eyes." Getting appropriate rest can be very helpful as prevention. "First and foremost is protection with sunscreen and sun protection with sunglasses in order to protect from ultraviolet damage that causes aging of the skin and further pigmentation," Levin says. "The problem is that many cosmeceuticals creams and gels on the market do little for chronically dilated veins, volume loss, and excess pigmentation and often require in-office procedures, such as injectable fillers and lasers," Levin continues. "I strongly recommend is protection from UV light with a broad-spectrum sunscreen. Also, moisturizing and maintaining a healthy skin barrier are important to avoid skin irritation and dryness." Skincare Ideas: Finally, the part we've been waiting for… Fusco recommends using "an eye cream that is specifically formulated for good eye health. This means it has ingredients that reduce puffiness like caffeine and licorice (puffiness contributes to the appearance of dark circles)." Engelmen reminds us that "there isn't much we can do to alter genetics, but there are quite a few things you can do at the doctor's office to minimize the appearance of dark circles like under-eye fillers and lasers. Topically, there are products to reduce all the things that contribute to dark circles." Scroll through the major ingredients to look out for while shopping for the best eye creams for dark circles. Caffeine: Shafer says "Caffeine is also a great ingredient for under the eyes as it gives vasoconstriction and boosts the skin energy." Levin also recommends looking out for caffeine in creams. "Tea bags have been used to de-puff around the eyes because of the decongesting properties of caffeine. Caffeine is a vasoconstrictor, which in turns reduces redness, swelling, and extensive fluid from pooling around the eyes. This will give a tightened appearance around the eyes. Furthermore, caffeine has been shown to neutralize free radicals from DNA damage and contains anti-inflammatory properties which can further improve skin texture," she says. Hyaluronic Acid, Ceramides, and Humectants: These work "to moisturize the delicate skin around the eyes. The periorbital area is a common area that dries and irritates easily, especially in women since we are applying multiple products daily. Therefore, keeping a strong skin barrier to this delicate area is crucial," says Levin. Soon Yoo Bae says, "Lightening products with kojic acid, glycolic acid, hydroquinone, vitamin c can be helpful. Products with hyaluronic acid can also help hydrate the skin, which can help with the under-eye appearance." Vitamin B3 (Niacinamide): "This vitamin not only calms down redness and inflammation but stimulates collagen production and increases free fatty acids in the skin to hydrate," says Levin. And Shafer says "tranexamic acid from lytera helps reduce pigmentation as well as phenylethyl resorcinol and niacinamide, tetrapeptide-30 and palmitoyl tetrapeptide, which all balance melanin production." Retinol: Engelman says, "For thin skin, a retinol can stimulate collagen production; so can ceramides like Elizabeth Arden Ceramide Eye Capsules, which contain ceramides, cholesterol, and essential fatty acids that support the integrity of our skin's lipid layer." Adds Bae, "Retinoic acid creams can be used very cautiously to help slough the darkly pigmented skin." Fusco also says, "Ingredients to look out for in eye creams include licorice, retinal, rose oil, COGIC acid." Vitamins A, C, and E: Shafer says, "Ingredients such as Vitamins A, C, and E help with skin health and collagen. HSA from Senté is a cellular modulator, which triggers rejuvenation of the skin cells." Vitamin C is integral in collagen production, helps brighten the skin, and is a powerhouse antioxidant but also is incredibly unstable to formulate and the combination with antioxidants enhances neutralization of free radicals and can stabilize vitamin C, says Levin. Levin's Pick: "One of my favorites is SkinBetter Eye Cream that can be found in your dermatologist’s office. 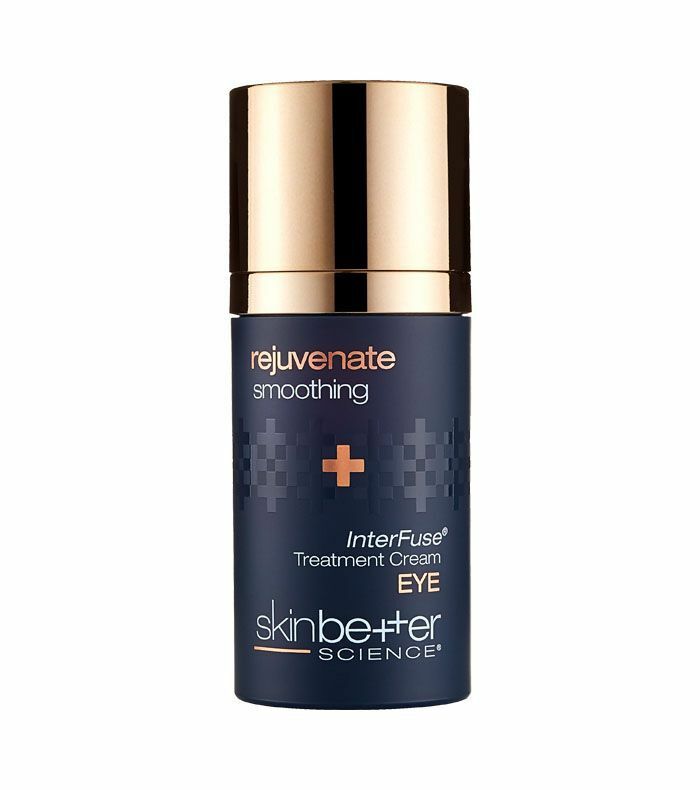 It not only targets hydration and dark circles but focuses on anti-aging as well since it is elegantly formulated with a number of active ingredients peptides, neuro-calming peptides, vitamin C, humectants, antioxidants, moisturizing ingredients, and caffeine to decrease puffiness, dehydration, and under-eye bags without causing irritation." Levin's Pick: "I love Cetaphil Hydrating Eye Cream as a 'gateway' eye cream that doesn't break your wallet! This eye cream focuses on hydration and brightening since a primary concern is dryness and dark circles. The eye cream is chock-full of hydrating ingredients including vitamin E, vitamin B3, and my favorite, hyaluronic acid, providing 24-hour hydration. It also has brightening ingredients licorice root and grape extract and is gentle enough to be used under the eyes and eyelids." Fusco's Pick: "Some dark circles appear that way because of thinning skin and an indentation or trough that appears. Individual with this type benefit by using a deep puffing cream at night, which works while you’re sleeping, and then in the morning, as soon as they wake up, applying an eye mask that has been chilling in the refrigerator. Oh K! Ginseng and Eucalyptus Masks are excellent for this." Engelman's Pick: "For someone who is not ready for the TNS serum for the entire face, I recommend the SkinMedica TNS Eye Repair. It is designed to repair, nourish, and protect the delicate skin surrounding the eyes. Its rich texture supplies plumping moisture with hyaluronic acid in order to diminish dehydration lines and increase radiance and brightness. Vitamins A, C, and E provide antioxidant protection as they condition the skin and help to lighten dark under-eye circles. Peptides and TNS awaken and brighten the eye area, helping to preserve a youthful appearance." Shafer's Pick: "Jack Black Protein Eye Booster contains grape seed extract and vitamins A, C, and E to help brighten skin and reduce the appearance of fine lines. I love the roller ball applicator so that you’re not rubbing your eyes with your fingers." Fusco's Pick: "Under-eye wrinkles and crow's feet can make existing dark circles appear even darker, so it is very important to hydrate the under-eye. But you don't want to over-hydrate and cause the skin to puff. An excellent choice for this would be Weleda renewing eye cream, which contains musk rose seed oil, which is excellent for delicate skin, and it hydrates without popping up." Fusco's Pick: "An eye cream that has peptides and anti-agers like NeoGlucosamine; NeoStrata Skin Active Intensive Eye Therapy works short term and long term." Engelman's Pick: "Having a dedicated eye product is very important for people after the age of 25. I like the Elizabeth Arden Ceramide Eye Capsules at night and the Valmont Eye Cream in the morning." Levin's Pick: "Revision's Teamine Eye Complex has been a favorite of dermatologists for dark circles for many years. It’s formulated with three different antioxidants including vitamin C, green tea extract, and grape seed oil as well as skin brighteners including mica, silica, and titanium dioxide." Shafer's Pick: "Jack Black De-Puffing and Cooling Gel contains peptides to aggressively target crow's feet and expression lines. Peptides tighten the skin to reduce the sogginess that can contribute to the appearance of darker under-eye circles." Shafer's Pick: "Medical grade products such as SkinMedica Lytera 2.0 can help lighten and brighten the skin. It's important to know that all of these products work at the molecular level, and improvement will be seen over weeks of regular use. Common sense approaches are also important such as using daily SPF to prevent pigmentation." Up Next: Dermatologists Say This Simple Routine Is the Secret to Glowing Skin. This post was originally published on April 20, 2018, and has since been updated.